It's no surprise that the ongoing trend of housing demand outpacing supply has followed us into the month of May. 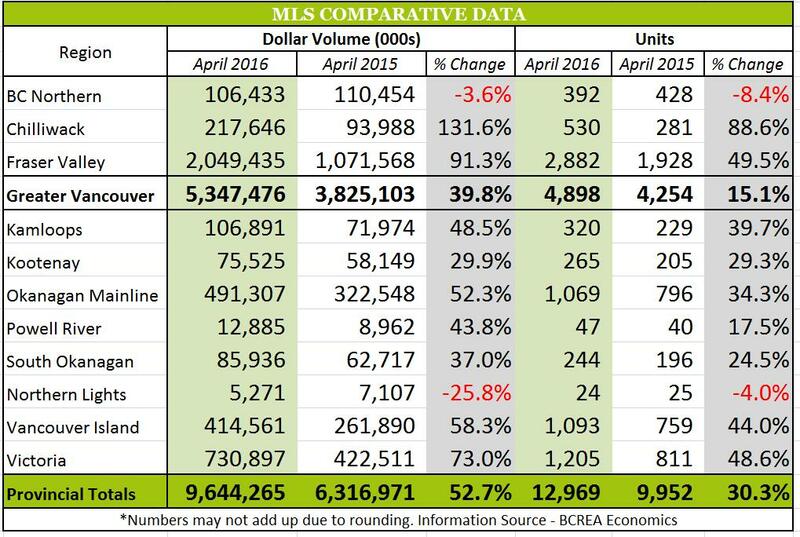 Let's look back at April 2016 statistics to solidify our understanding of the housing market. There has been an increase of 30.3% residential unit sales when comparing April 2016 to April 2015 with a total of 12,969 units recorded. The total sales dollar volume was $9.64 Billion which is a 52.7% increase compared to the same period in time last year. Looking at the average MLS® residential price in BC of $743,640 shows a year-over-year increase of 17.2%. “Housing demand is exceptionally strong across the southern regions of the province,” said Cameron Muir, BCREA Chief Economist. “Consumers appear to be particularly active in the Vancouver Island, the Fraser Valley and the Thompson/Okanagan regions.” “Strong employment growth is helping underpin consumer confidence,” added Muir. Despite what appears to be a period of higher than normal unemployment, there has been an additional 78,000 workers employed in BC in the first quarter of 2016 which is a 3.5% increase in comparison to the same period last year. Looking at the year-to-date statistics, the BC residential sales dollar volume is sitting at $31.2 Billion (64.3% increase), unit sales total 28,028 units (36.2% increase) and the average MLS® residential price is currently $761,860 (20.6% increase). 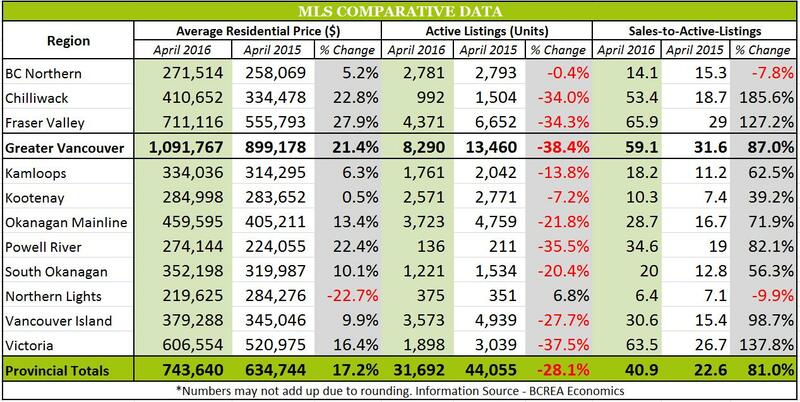 Take a look below for a regional breakdown of MLS comparative data and the changes from April 2015 to April 2016. For all your real estate needs, contact Amalia Liapis by e-mail at amalia@wesellvancouver.ca or alternatively by phone at 604-618-7000.